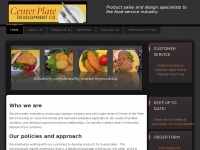 Center Plate is a marketing and product design company who distributes center of the plate items that represent the largest per meal dollar expenditure to the food service industry. A profile of Centerplate.us was found on the social network Twitter. The web server used by Centerplate.us is located in Traverse City, USA and is run by CloudAccess.net, LLC. On this web server 77 other websites are hosted. The language of those websites is mostly english. The Centerplate.us websites were developed using the programming language PHP and served by a Apache server. For managing the data of the webpages the CMS Joomla! is used. The website uses the latest markup standard HTML 5. The website prohibits search engines and webcrawlers indexing the website and following the links. Other actions by webcrawlers and bots are allowed.